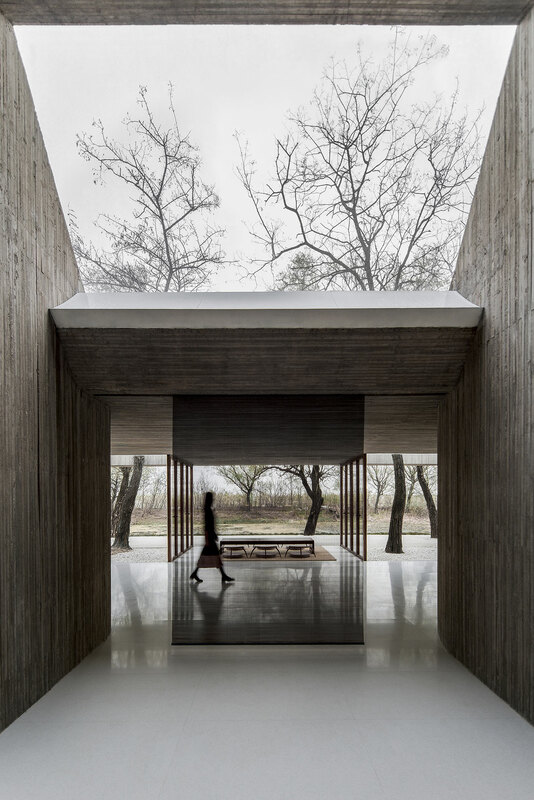 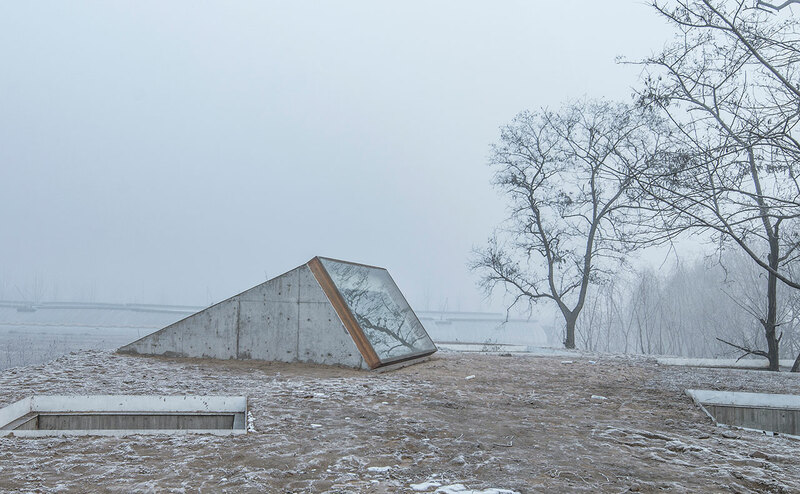 In the city of Tangshan, in China’s Hebei province, Han Wen-Qiang’s Archstudio has created a Buddhist shrine in the forest by the area’s river. 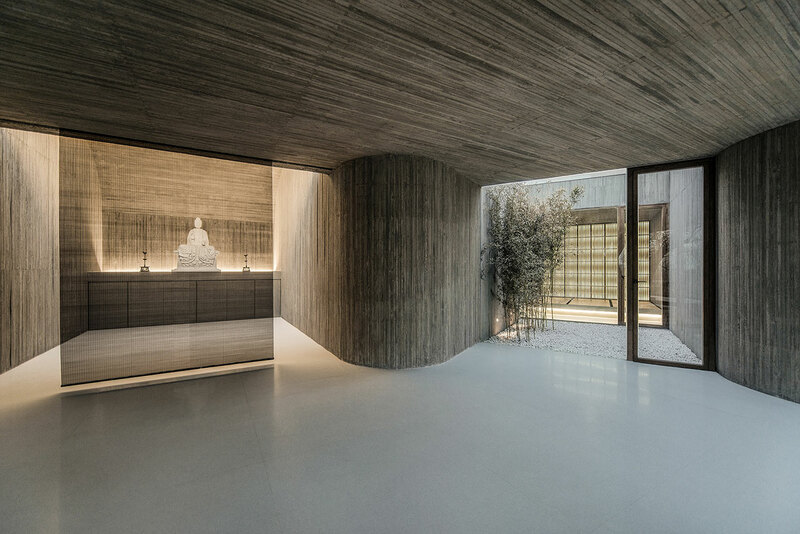 In 169 square meters, the celebrated architect’s design sets out to provide as little disruption possible, instead focusing on advancing a sense of unity and flow. 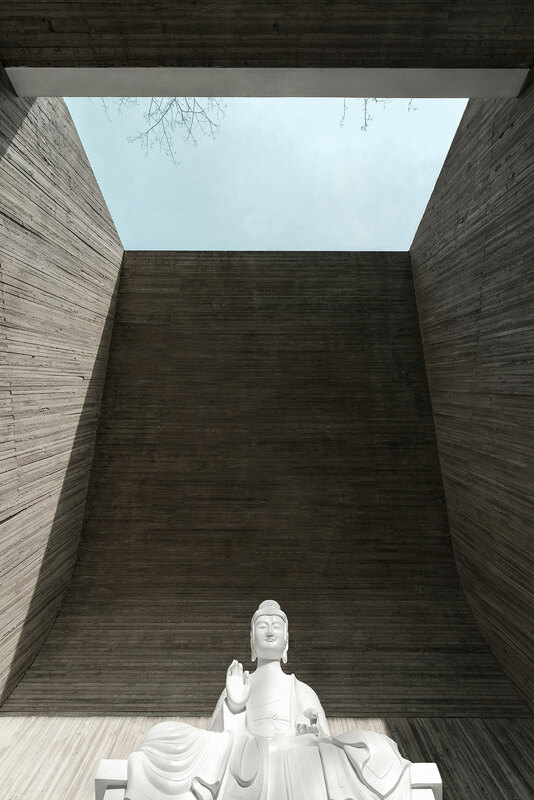 The Buddha was born and reborn under trees. 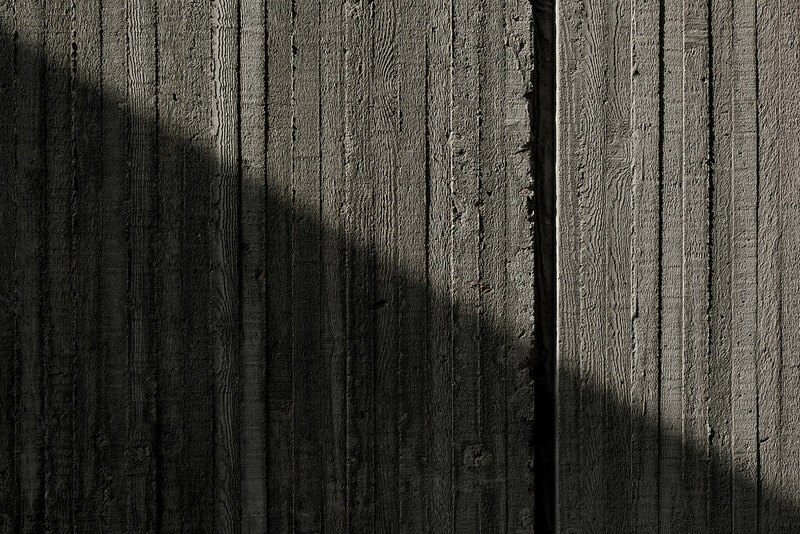 It is said that his mother gave birth to him under a sal tree, and he found his spiritual awakening under a pipal tree. 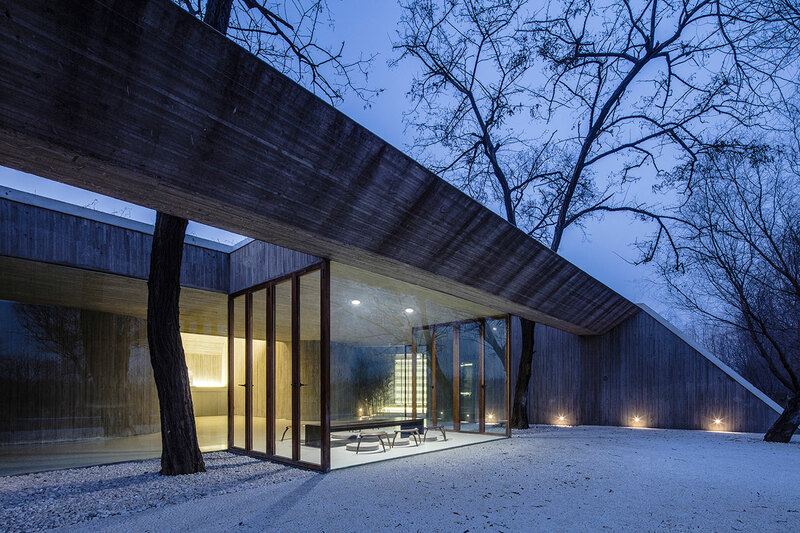 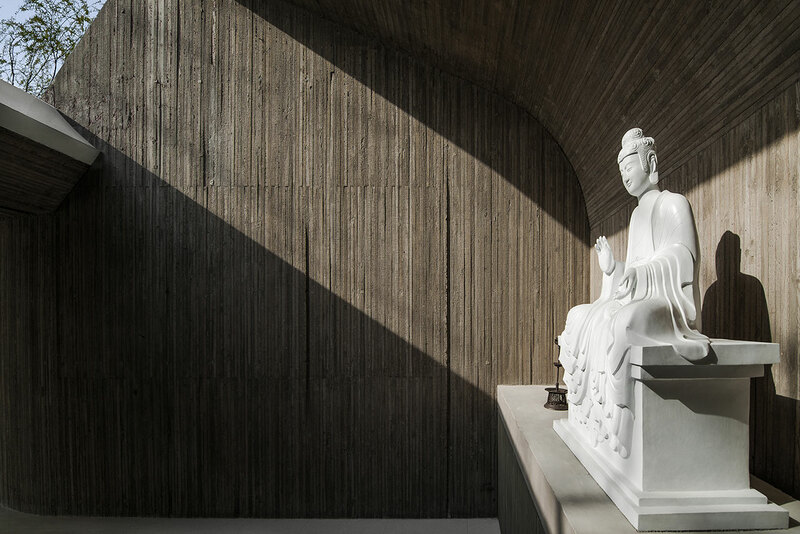 Archstudio’s Buddhist shrine follows a similar path. 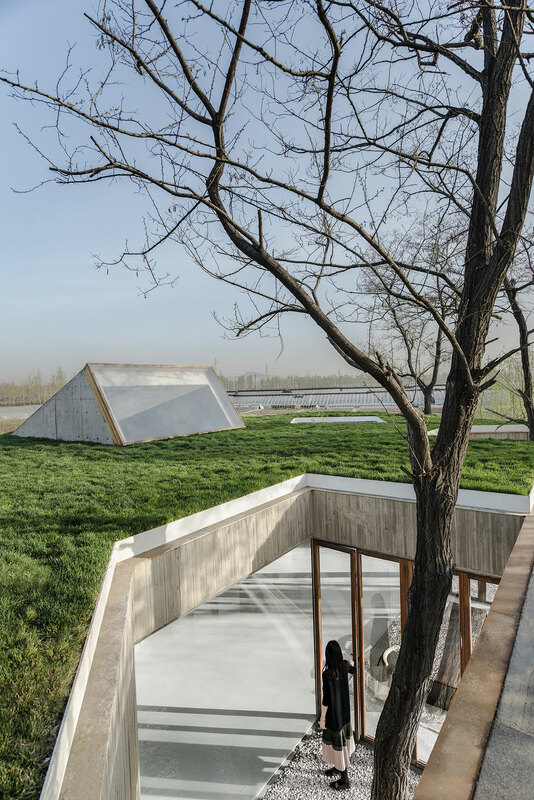 Stressing the features of the landscape, the building is designed around the mound defining the area, and the trees that line it. 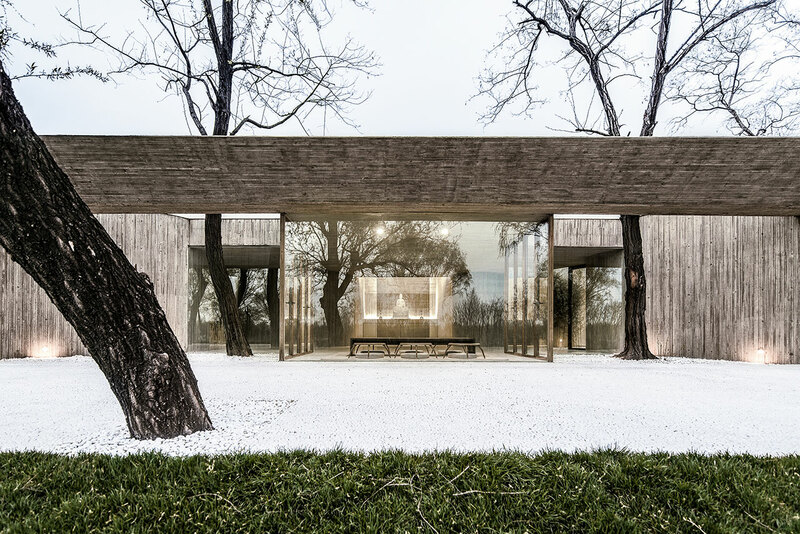 Avoiding all tree trunks surrounding it, the shrine is instead built around them, as if flowing from them. 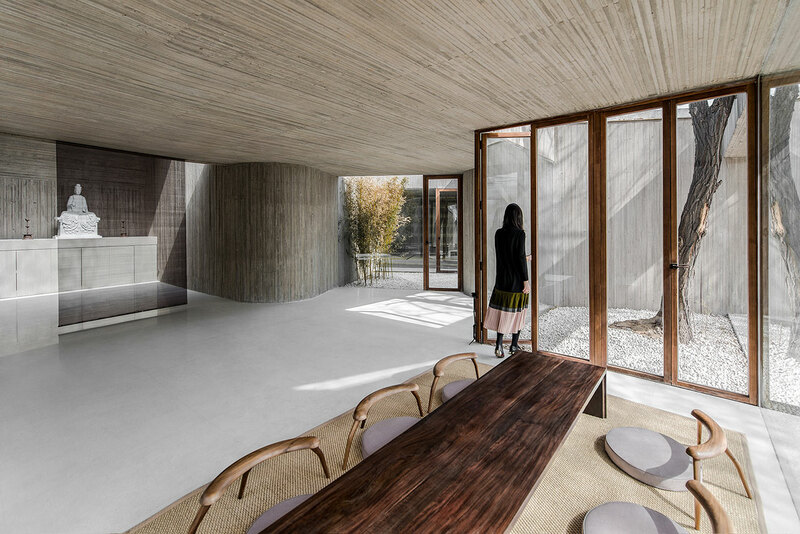 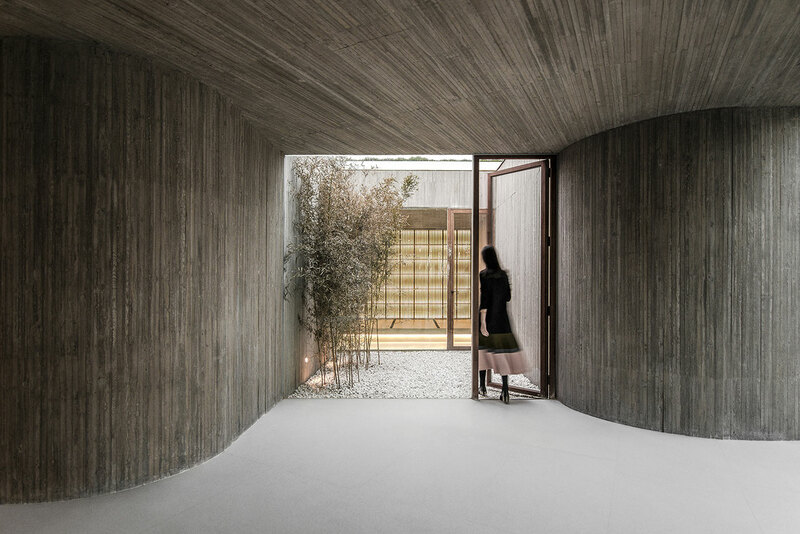 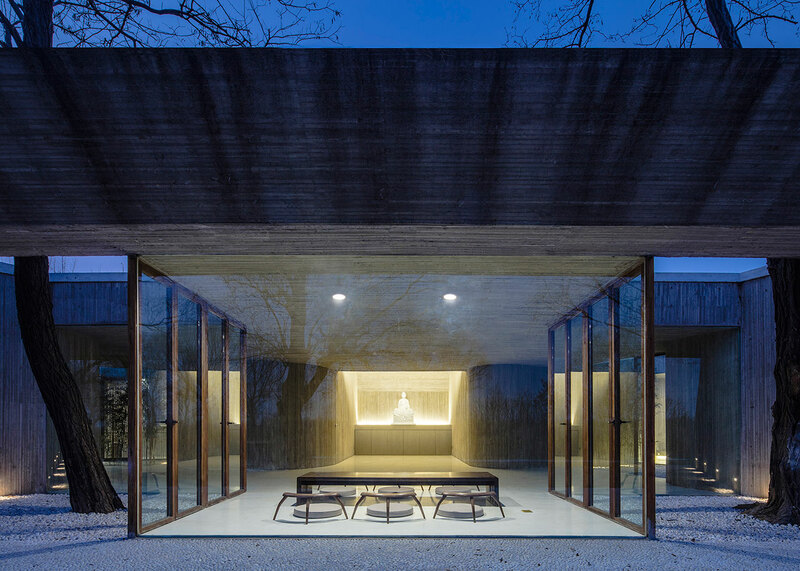 It was conceived of as new branches extending the existing forest through five separated and continuous spaces: The shrine’s entrance, the meditation room, the tea room, living room and bathroom. 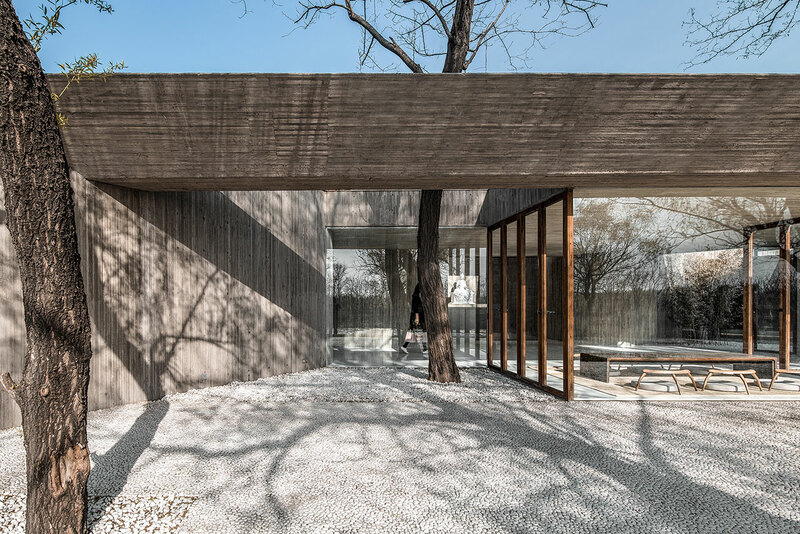 Calling back to Buddha’s awakening, the entrance to the shrine faces two trees, under which visitors have to enter. 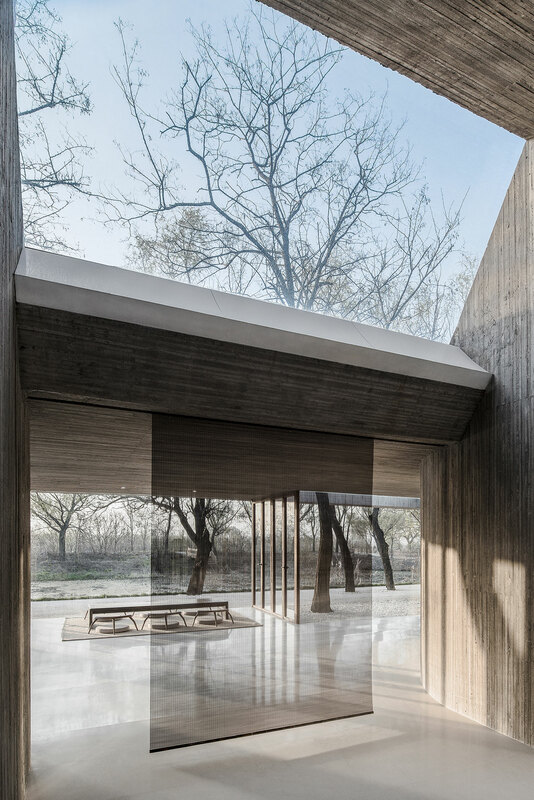 The meditation room takes advantage of a large skylight that bathes it in sunlight and also looks out towards the towering tree branches, again recreating the environment of Buddha’s awakening. 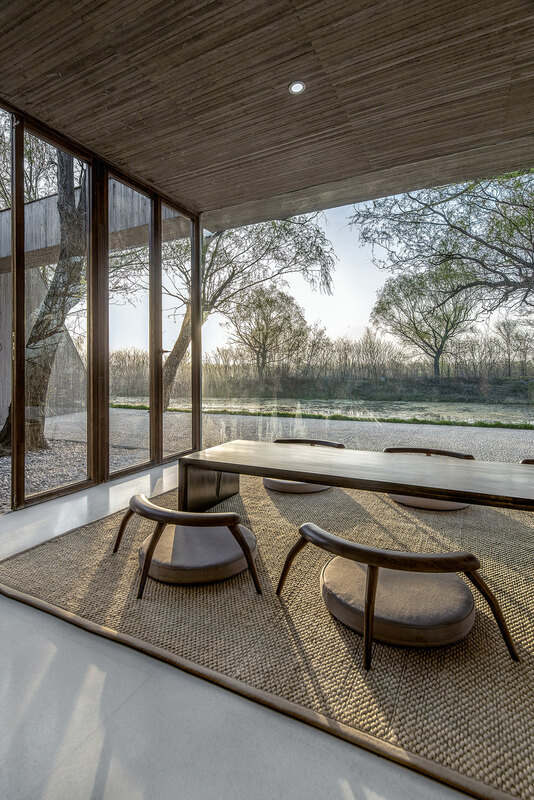 The tea room opens up to a lotus-filled pool, while the living room is separated by the rest of the building through a bamboo courtyard. 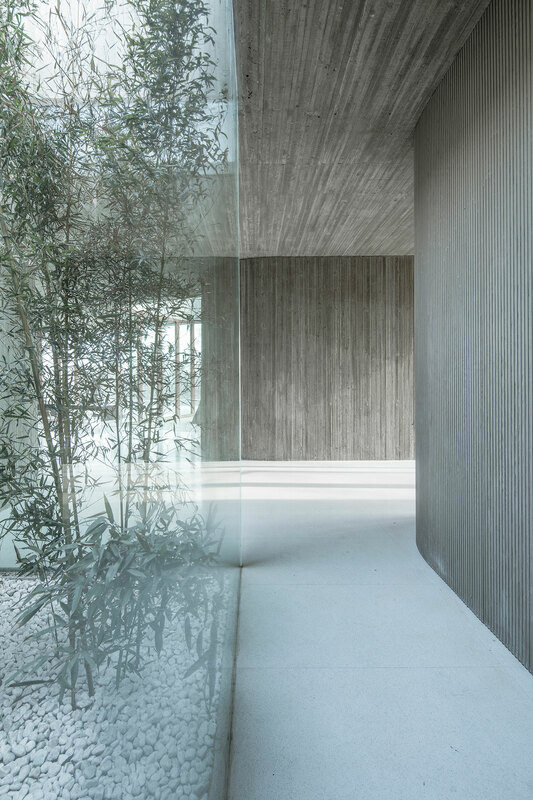 The concept of trees is also found in the materials that are used. 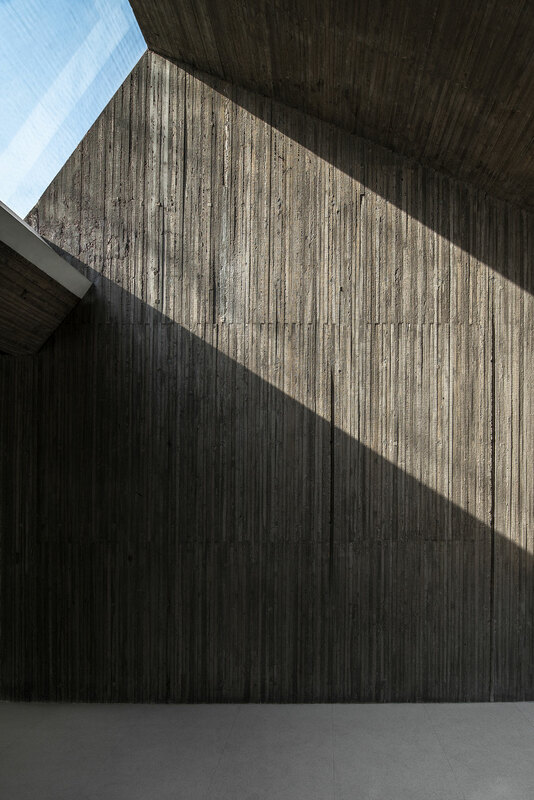 The integral concreting used in the shrine’s walls and roof relies on a formwork pieced together with pine strips, impressing natural wood grain into its vertical linear texture; at the same time, the custom-built furniture complements the design, featuring solid wood for all doors and windows. 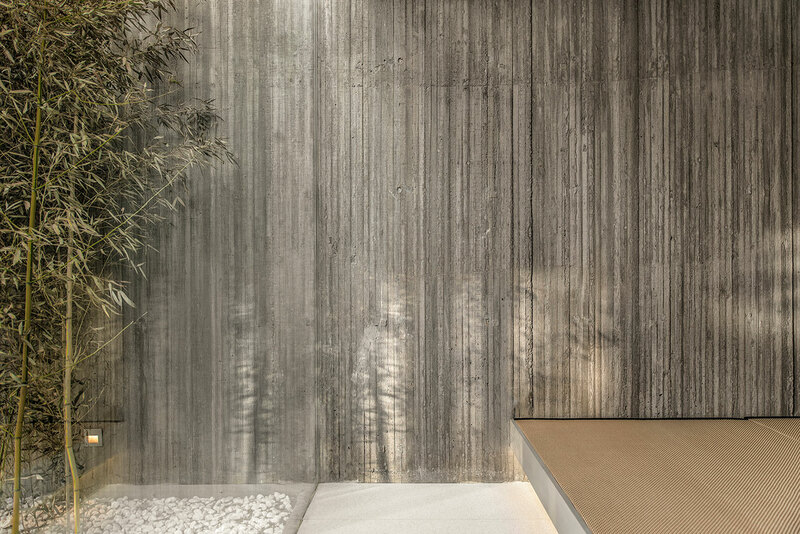 Flow is most important in the shrine’s Zen design. 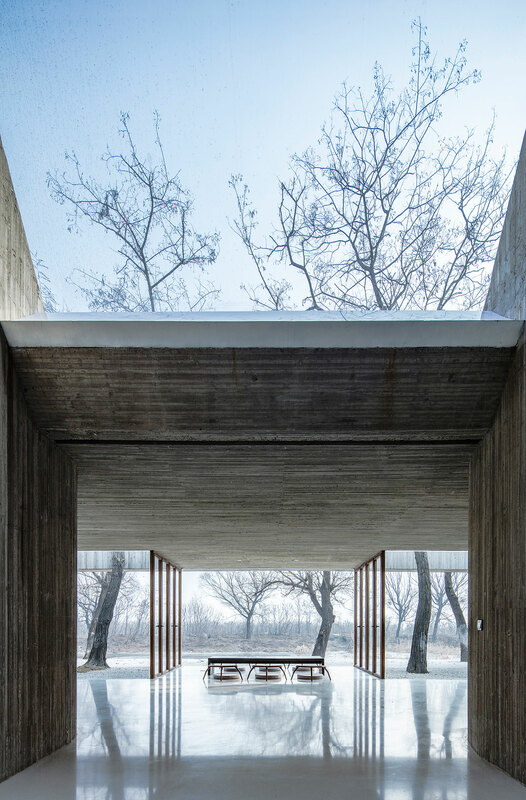 The structure itself, immersed -and at times even submerged- in nature mimics a spiritual yet naturalistic path. 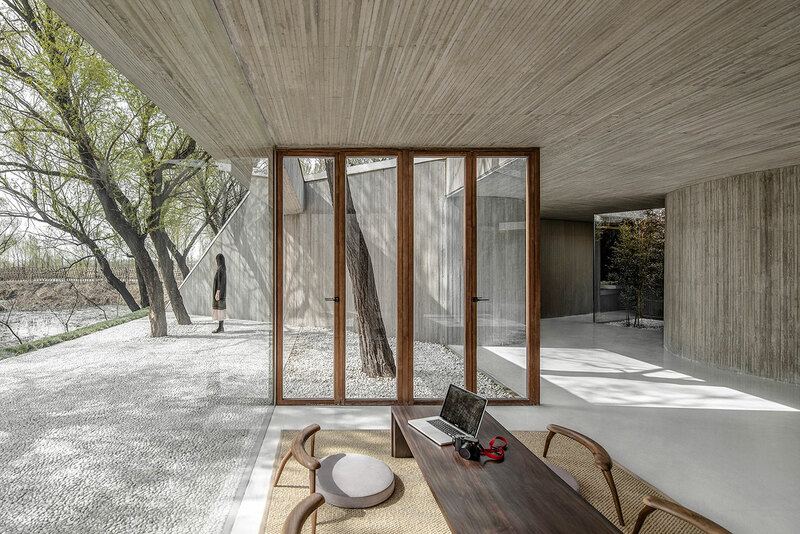 Unity of everyday life and spiritual life as a balanced interaction with nature is the design’s guiding force. 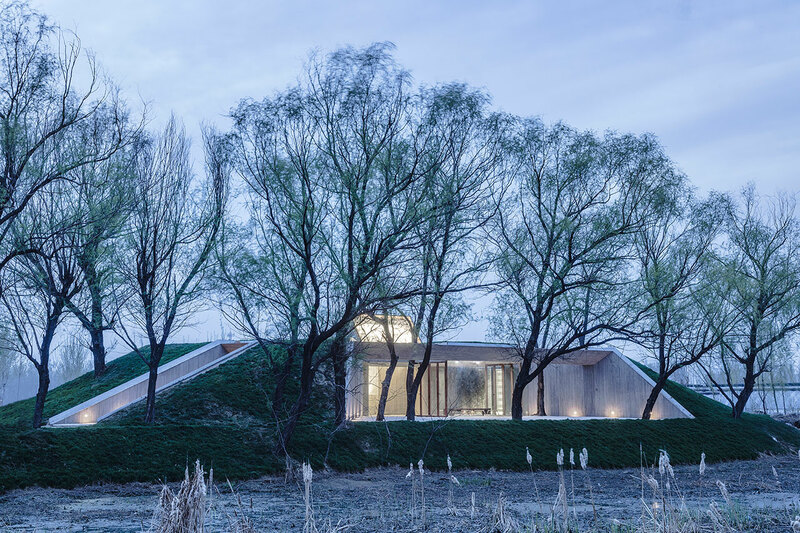 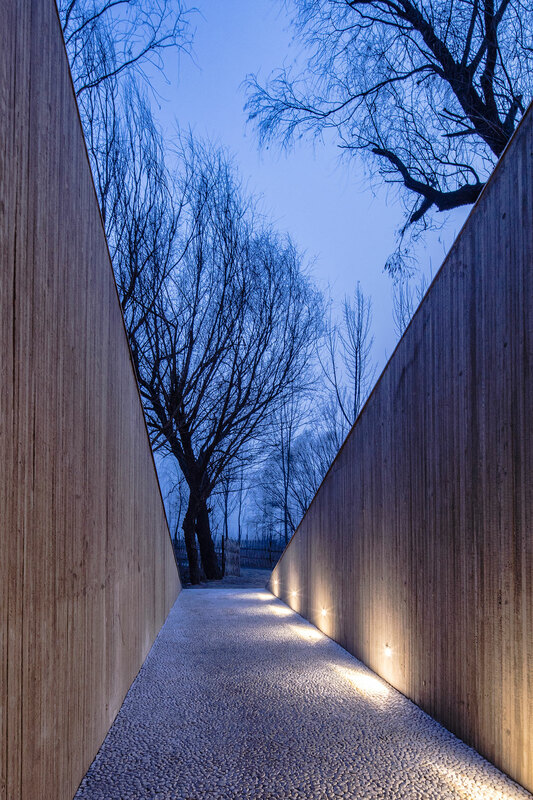 As the shrine is earthed into the area’s mound, the trees and the building’s underground development provide a vertical axis that speaks to spirituality, while two additional axes define the structure: One that runs from north to south, while the other follows the river’s direction. 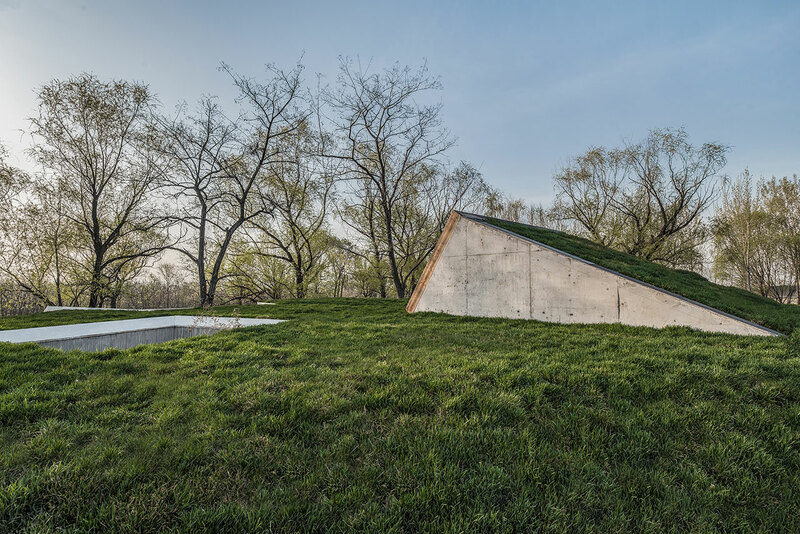 Interestingly, the shrine’s geometric volumes strike a balance with their natural environment, reconstructing its ascetic grace and meaningful simplicity into its spiritual function, while also providing a setting for meeting the needs of everyday life. 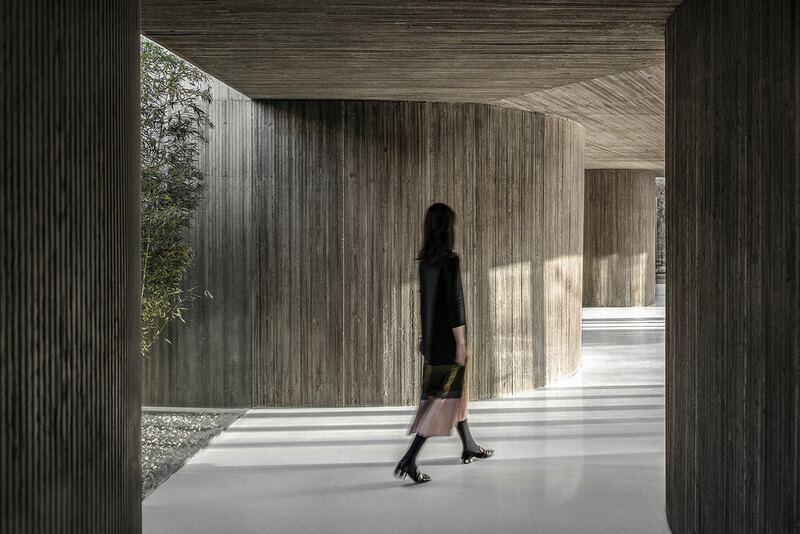 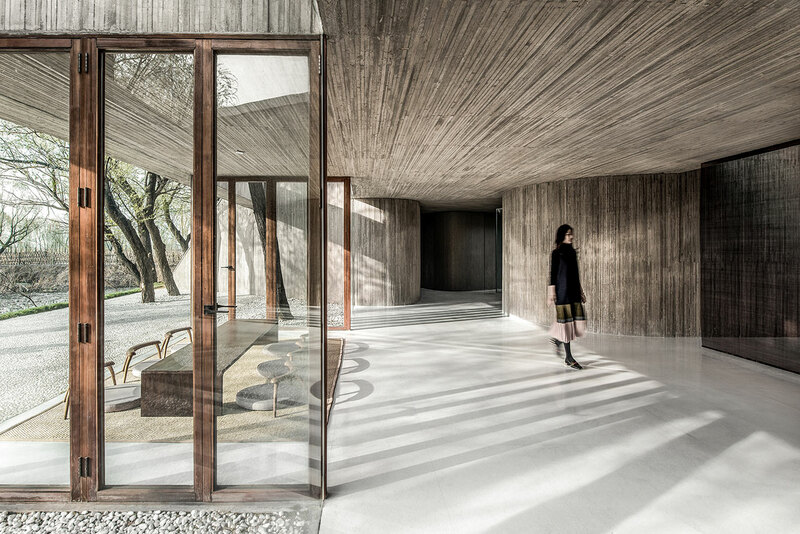 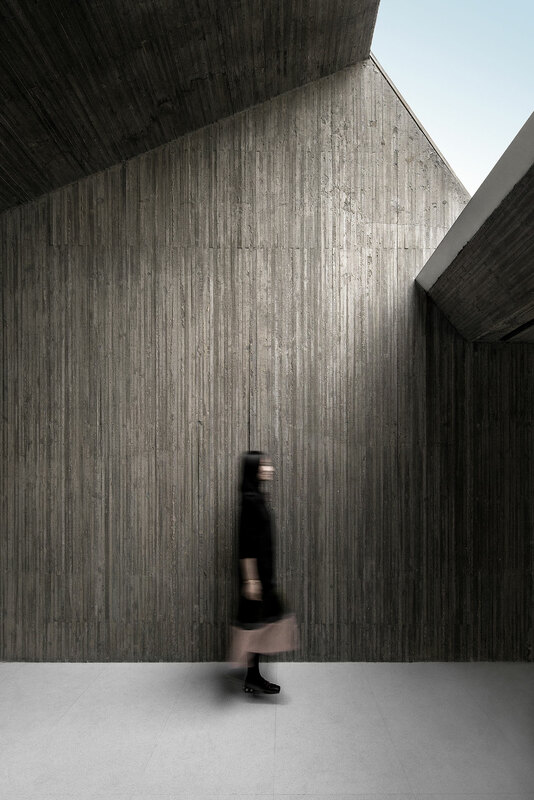 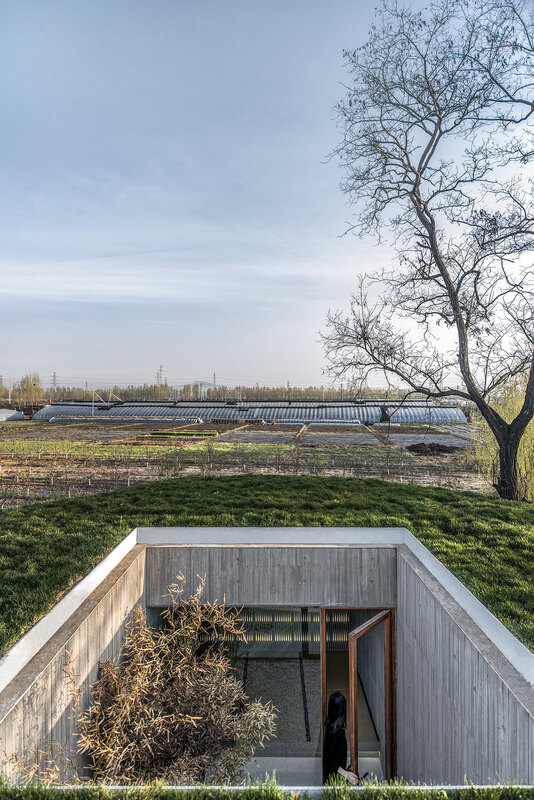 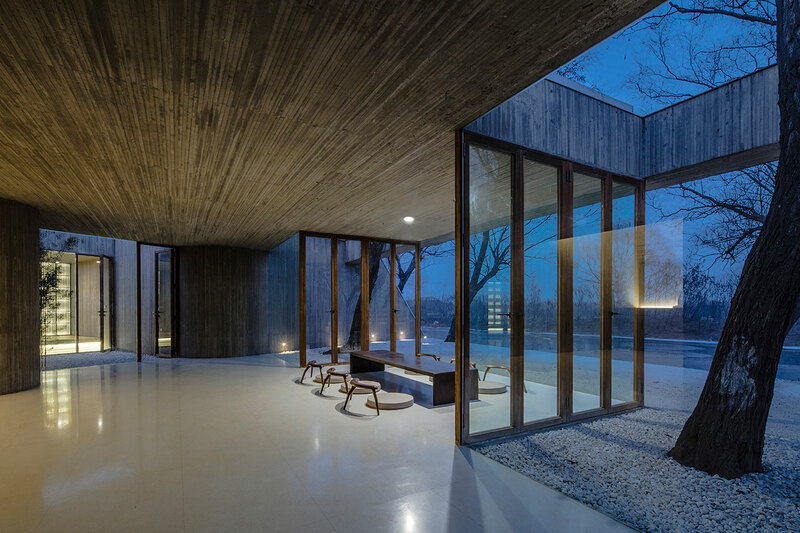 In this, as Wen-Qiang designs “a space with power of perception, where trees, water, Buddha and human coexist”, so too coexist both natural and meticulously constructed environments.